Being in your early 20s is strange, because while you are an "adult", the world will constantly tell you "no girl, you are definitely not an adult". From the money in your bank account to the physical space you live in (likely your childhood bedroom for some + a small walk-up for others), everything does not feel very adult all of the time. Another fallacy is that you will spend every evening with friends on a a big couch. You won't but you can bribe a few to stick around with a plate full of goat-cheese stuffed mushrooms. So when life hands you mushrooms, stuff them. Stuff them with goat cheese, maybe some parsley, breadcrumbs, and a hint of honey too. The best part about this recipe is that while you can follow it step by step, there is truly no way to mess this up by adding a little more or less of one ingredient. Drizzle a shallow oven safe baking dish with a generous amount of olive oil. Toss the mushrooms in the olive oil, and then position the mushrooms in the dish top side down. In a food processor combine the goat cheese, garlic cloves, bread crumbs, parsley, honey, red pepper flakes, and salt and pepper to taste. Pulverize the mixture until the parsley is fully incorporated and there are no large chunks of garlic left. 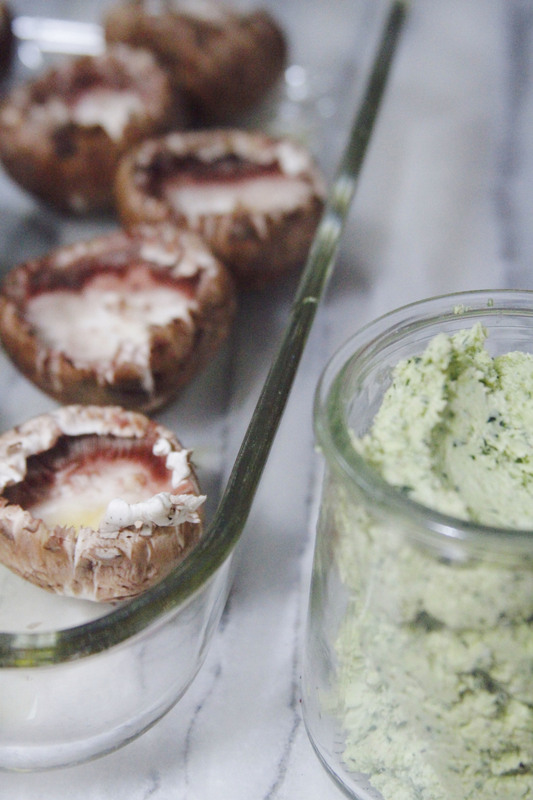 To assemble, fill the well of each mushroom with the goat cheese mixture. 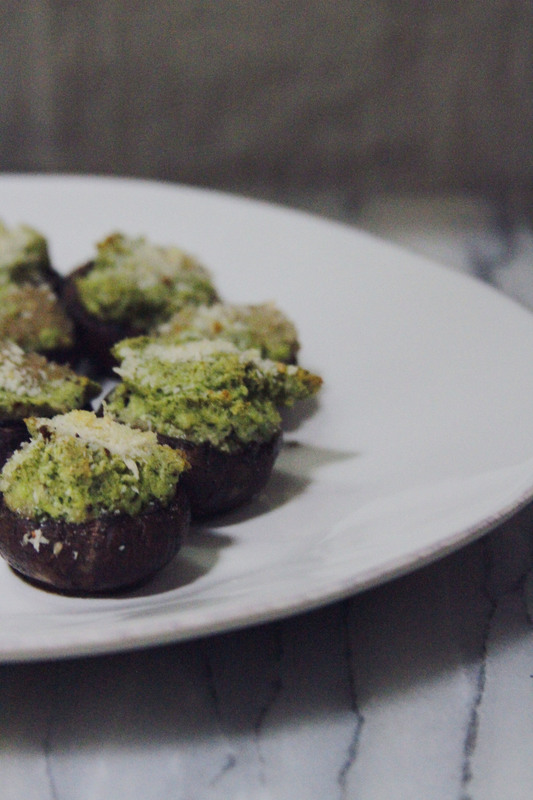 Press additional breadcrumbs onto the top of each mushroom, sprinkle each mushrooms with bit more pepper and top each with a dash of olive oil. 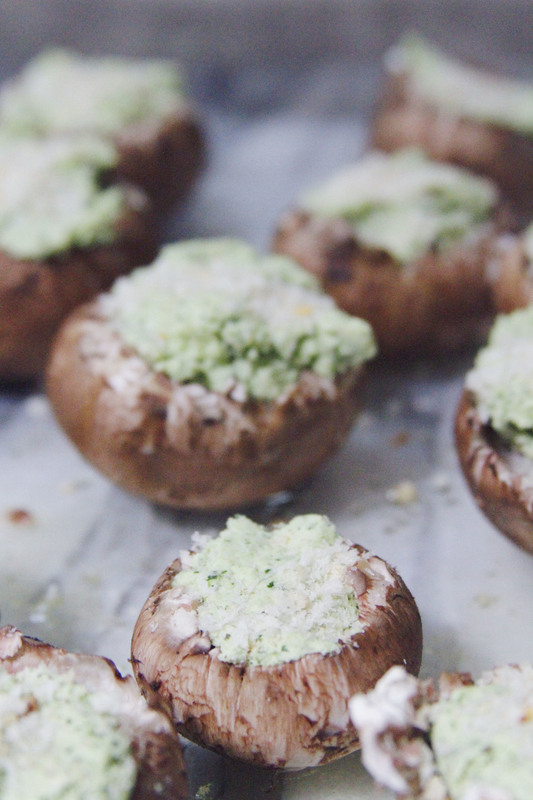 Place the dish into the oven and allow the mushrooms to cook for around 20-25 minutes.